Ria Formosa is a Natural Park that runs from Faro to near Castro Marim, it's one of Nature's untouched paradises and the ideal place if you want to have a nice and relaxed moment. The Algarve’s riches include Nature, the scenery and the climate. The visitor can observe the singularity of the flora and fauna throughout the region. Being a tourist region, the presence of human beings should be associated with conservation, preservation and the civic practices of all the users and consumers of these resources which are truly unique. 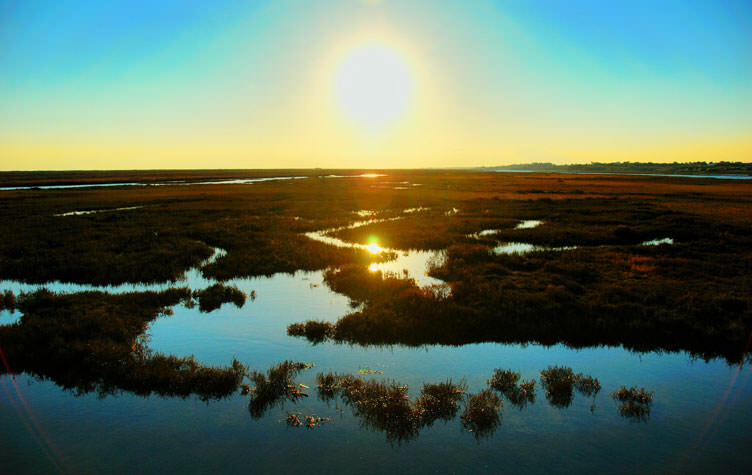 The Ria Formosa - a coastal lagoon with marshes, salt lakes, mud or sand banks, islets, beaches, dunes and numerous watercourses with barrier islands that outline the limits of an extensive wetland area - was the meeting place of Mediterranean, Phoenician, Greek, Carthaginian, Roman and Arab people and cultures. Situated in the Sotavento Algarvio (leeward, or eastern side of the Algarve) it extends over the municipalities of Faro, Loulé, Olhão, Tavira and Vila Real de Santo António. The diversity of the fauna and flora is visible along the 18 400ha, 3600ha of which are permanently inundated and include a variety of habitats: marshland (3430ha); fish farming (460ha); fresh water and brackish or saline wetlands, watercourses, vegetation, farming areas, shrub land and pine woods. Various activities are carried out in this area protected by the Parque Natural da Ria Formosa (Ria Formosa Nature Park), amongst which are fish farming, aquaculture, salt extraction and, especially shellfish farming, which helps enormously in developing the economy of the region. This region heralds a natural heritage with various species of mammals, birds, reptiles, fish and mollusks. Throughout the areas of low lands and salt lakes there exist species such as: the Purple Gallinule or the Purple Swamphen, a long-legged bird easily recognised thanks to its unusually long legs and its characteristic low-altitude flight. The otter, genet, woodpecker, badger and fox, amongst others, are animals which search out the Ria Formosa. Where reptiles are concerned, pride of place goes to the chameleon (Chamaeleo chamaeleon). There is a large variety of bivalves and molluscs. The clam (Ruditapes decussatus) is known for its characteristic flavour and is an essential ingredient in the popular cataplanas. Oysters, cockles and razor-shells are among the Ria Formosa rich habitat.